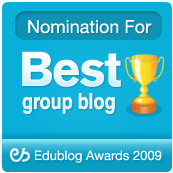 Yes, this edition of the Carnival is hosted by the blog The Math Less Traveled, a blog “dedicated to exploring beautiful mathematics”. The author, a computer scientist, also maintains another computer science blog:: Brent -> [string]. Thanks to Ole Arntzen of the IT Department at the University of Bergen (Universitetet i Bergen) for providing a customizable dodecahedral calendar generator. You select the shape, year, language (from approximately 50 options), format (ps or pdf), and whether the week starts on Sunday or Monday; the resulting postscript or PDF file can be saved and printed, and assembled into a polyhedral calendar. Each unit in this brand, introduced in 1968, is a hyperbolic paraboloid, & they fit together for perfect storage. Homer: You lousy two-timing [bleep-bleep]! I’m gonna [bleep]! Kang: Oh yeah? 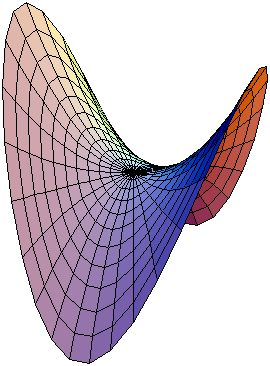 Well [bleep] hyperbolic paraboloid! [bleep] yo mama! I guess it’s an insult as well as a quadric surface. for some integer n and some constant c. (Question: Is there a name for such functions? I feel like I should know this.) When does this technique fail?